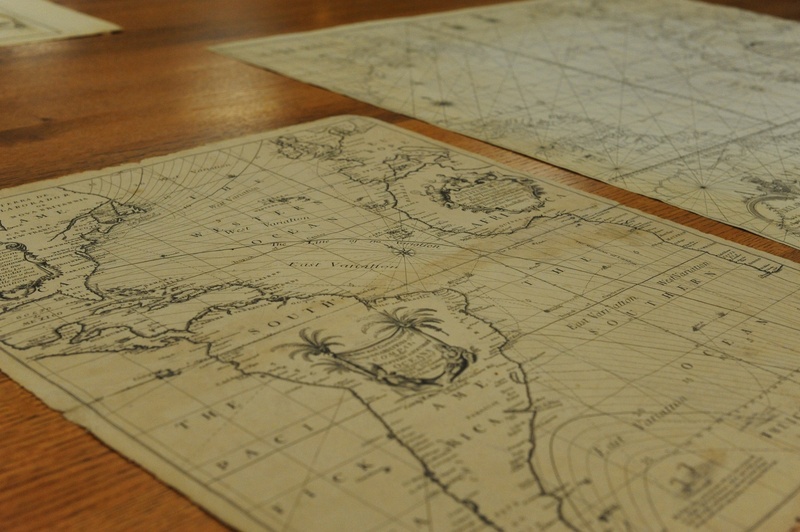 Antique maps in Harvard University’s map collection in Pusey Library. The Harvard Map Collection’s exhibit on ink-drawn-maps will come to a close next week, ending a display of antique maps that has been open to the public in the Pusey Library since May. The “Manuscript Maps: Hand-Drawn Treasures of the Harvard Map Collection” exhibit has been open to both Harvard affiliates and the general public free of charge. The maps are centuries old—in one case dating back to 1620. The oldest work in the collection, a portolan chart made in Marseille, is a richly colored example of a style of maps rarely seen today. The chart was drawn on vellum parchment with lapis lazuli, toasted lead, verdigris, and gold to produce bold colors that have endured four centuries. Another one of of the highlights of the collection is “Massachusetts,” a multi-layer map of the state from the mid-nineteenth century. While the original copy is kept behind glass, there is an uncovered reproduction on display. Visitors may lift the map’s layers to reveal an abandoned draft beneath. This diversity in geography and time was carefully considered by the curators of the exhibit. “It’s always a matter of figuring out the kind of story you want to tell,” Weimer said. The Map Collection boasts more than 400,000 maps, meaning that selecting individual maps to display for the exhibit could be complicated. “It was [a matter of] balancing some of the unique personal stories that each of the maps has, against how striking they were visually, versus some geographical range,” Weimer said. This exhibit will be on view in the Map Gallery Hall on the first floor of Pusey Library from 9 a.m. to 5 p.m from Monday through Friday and from 10 a.m. to 2 p.m. on Saturday through Sept. 27. The Map Collection has also made an online version of the exhibit available. The Map Collection offers print reproductions for $2 per square foot for University students, faculty members, and staff. What might be lost as the result of our being perennially found?